Many travel sites charge travelers a service fee (from 3%-15%) when booking through their sites. Welcome to "The Last Hawaiian Place"
Enjoy panoramic oceanfront views, breathtaking sunrises and moonlit nights. Relax on our exquisite grounds, full kitchens, private lanais, free wifi. Hana is a place where one loses track of time. This is Hawaii unspoiled. 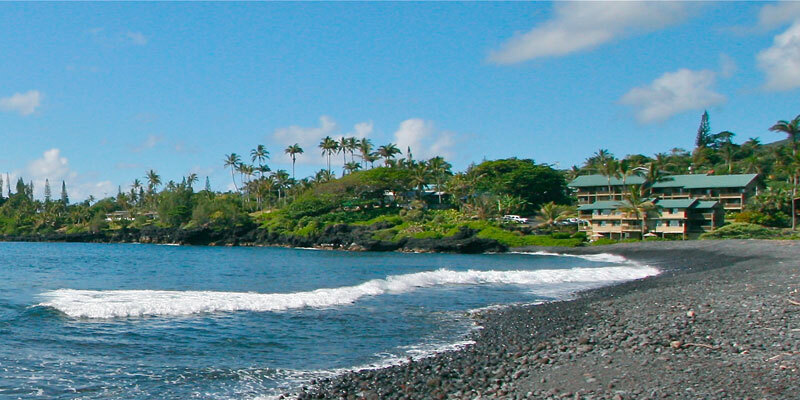 Hana Kai Maui welcomes you to our beautiful oceanfront vacation rentals on Hana Bay at Waikaloa Beach. We offer first class studio, one- and two-bedroom Hana accommodations that feature exquisite grounds, beachside barbeque, fully equipped kitchens, private lanais, and free wireless internet service. Many of our Hana condos have panoramic oceanfront views where you can experience incredible sunrises and moonlit nights while turtles and dolphins swim nearby in the surf. As you travel the beautiful Hana Highway through Maui’s untouched rainforest, you will be surrounded by breathtaking views, majestic waterfalls and a lush tropical landscape. Your journey ends as you reach the town of Hana. Here is unspoiled Hawaii, where you can relax and enjoy the true spirit of Aloha. Hana is a place where one loses track of time, where mystical days and tranquil nights simply unfold. The Hana coast offers some of Hawaii’s most beautiful beaches. From the black sands of Wainapanapa State Park to world famous Hamoa Beach, you can enjoy swimming, snorkeling or surfing close to your doorstep. There are many hidden places for you to explore. Just eight miles away, the pools at Oheo Gulch (“seven pools”) offer great scenery and refreshing swimming in Haleakala National Park. Hikers will enjoy a panoramic hike up through the bamboo forest to Waimoku Falls. The trails at Wainapanapa will bring you to fresh-water caves or take you along the coast to spectacular views where you can sometimes see humpback whales as you hike along the cliffs. Fill your day with a stroll along the beach, or find a quiet place to sit and enjoy the unspoiled beauty. Available nearby amenities include kayaking, horseback riding, tennis, dining out or a relaxing in-room massage. Hana is a place where one loses track of time, where mystical days and tranquil nights simply unfold. Hana Kai Maui offers an unforgettable vacation for you and your family. Please take a look at each of our unique Hana vacation rentals and find the one that fits your needs. Hana Kai Maui is on Facebook!